Today I’m playing along on two challenges using an older wood-mounted stamp – ‘Walking in the Rain’ by Art Impresssions. As time was pretty short this evening, I kept it very simple using the colour palette from this week’s Color Throwdown Challenge (coral red, blue, green and kraft). The Case This Sketch challenge sketch calls for a sentiment in the right corner under the image, but as my image has a text frame, I decided to add three nailheads instead. 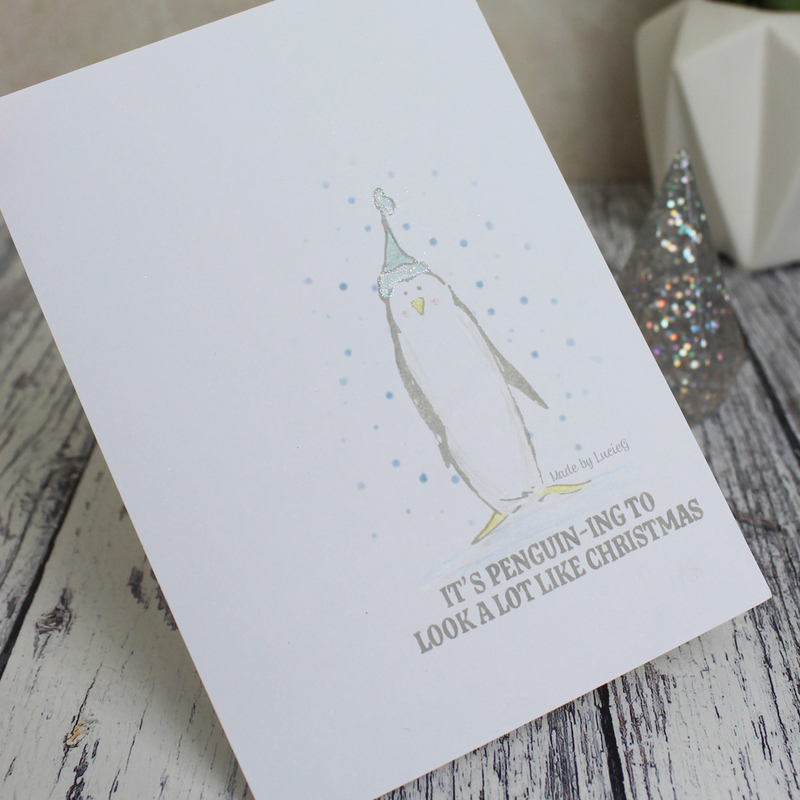 Today I used Art Impressions’ fabulous ‘Poley Penguin’ to create a quick CAS Christmas card. After stamping the image with Pumice Stone distress oxide ink, I masked it off and lightly stencilled an area around the image using an Echo Park stencil. I removed the mask and coloured the image using my Prismacolor pencil before adding some glitter to Poley’s hat! To finish off the card, I added a sentiment from Avery Elle. I’m entering this into the current CAS Christmas Card challenge – the theme is ‘birds’. I’m back with another card I made for a challenge – this time for the Freshly Made Sketches challenge. I coloured an Art Impressions image using my Twinkling H2Os and then adhered a white panel using funky foam. The strip of paper is from My Mind’s Eye and I used a Hero Arts stamp for the sentiment strip. To finish off the card, I cut a couple of Memory Box pumpkins that I had also coloured with Twinklings. For today’s card, I used an older Art Impressions image which I coloured using my Twinkling H2O’s. The colour of the hearts is really close to the colour of the patterned paper in real life – I couldn’t capture it properly in a photo, unfortunately. Anyway, I also used some of my older patterned paper from My Mind’s Eye, an older Avery Elle sentiment die and even a Martha Stewart punch which I think I’ve probably had for a decade!! I love using all the wonderful new products that companies are releasing, but it’s still so much fun to revisit older supplies too, don’t you think?! I’m entering this into the current Simon Says Stamp Wednesday challenge (Anything Goes/Art Impressions products) and as the As You See It Challenge. The theme for this week’s Simon Says Stamp Monday challenge is ‘hip hop’. As my Easter stamps are close at hand, I decided to use this bunny with attitude from Rubber Soul and a great sentiment from Art Impressions. I also did a little ink smooshing with my fabulous new Distress Oxide inks to create the background. Day 28 of The Daily Marker 30 Day Challenge and today I’ve been colouring an Art Impressions stamp with my Twinkling H2Os. Given the writing around the outside of the image, I decided the card didn’t need a sentiment, but I can always add one when I send this out. To make the image ‘pop’, I created a wide frame from some white card and layered it on top of the image using funky foam. I’m entering this into the current Addicted to CAS challenge – seaside.